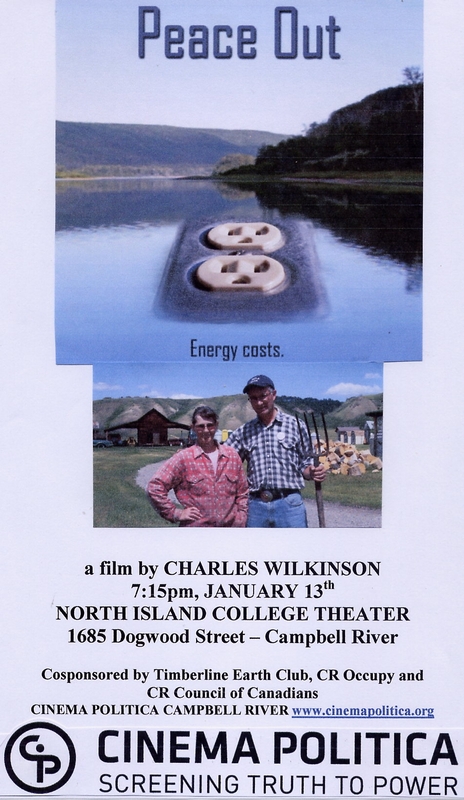 Council of Canadians Campbell River Chapter, Occupy Campbell River and Timberline Earth Club in association with Cinema Politica are proud to announce the Campbell River screening of ‘Peace Out’ – a film by Charles Wilkinson – at North Island College Theater, 1685 Dogwood Street at 7:15pm on January 13th. Admission is by donation. This 80 minute film is about B.C.’s vast Peace River region where mega-projects include a major new dam, tens of thousands of hydro-fracked shale gas wells, a nuclear power plant and the Tar Sands. Proponents of these projects argue that countless jobs are being created, resource revenues are pouring in, and schools and hospitals are staying open. Alternatively, there are credible charges that multinational corporations are despoiling an area the size of Florida, converting public assets into private fortunes and leaving a wake of Mordor-like destruction. ‘Peace Out’ is a heartfelt account of what’s really going on up North and how our choices down South are making it so. Mark your calendars for other upcoming films in our environmental and social justice film series: Feb. 17th: ‘Revolution’ Mar. 17th: ‘Troubled Water’ Apr. 14th: ‘A Fierce Green Fire’ May 12th: ‘Gasland’ AND a special screening of Velcrow Ripper’s award winning film ‘Occupy Love’(Date TBA). For more information: Cinema Politica Campbell River www.cinemapolitica.org or telephone (250) 286-3019.